Today, the State Rooms are open to the public and managed by the independent charity Historic Royal Palaces, a nonprofit organisation that does not receive public funds. The offices and private accommodation areas of the Palace remain the responsibility of the Royal Household and are maintained by the Royal Household Property Section. The palace also displays many paintings and other objects from the Royal Collection. Kensington Palace was originally a two-storey Jacobean mansion built by Sir George Coppin in 1605 in the village of Kensington. The mansion was purchased in 1619 by Heneage Finch, 1st Earl of Nottingham and was then known as Nottingham House. Shortly after William and Mary assumed the throne as joint monarchs in 1689, they began searching for a residence better suited for the comfort of the asthmatic William, as Whitehall Palace was too near the River Thames, with its fog and floods, for William's fragile health. In the summer of 1689, William and Mary bought Nottingham House from Secretary of State Daniel Finch, 2nd Earl of Nottingham for £20,000. They then instructed Sir Christopher Wren, Surveyor of the King's Works to begin an immediate expansion of the house. In order to save time and money, Wren kept the structure intact and added a three-storey pavilion at each of the four corners, providing more accommodation for the King and Queen and their attendants. The Queen’s Apartments were in the north-west pavilion and the King’s in the south-east. Wren then re-oriented the house to face west, building north and south wings to flank the approach, made into a proper cour d'honneur that was entered through an archway surmounted by a clock tower. The palace was surrounded by straight cut solitary lawns, and formal stately gardens, laid out with paths and flower beds at right angles, after the Dutch fashion. The royal court took residence in the palace shortly before Christmas 1689, and for the next seventy years, Kensington Palace was the favoured residence of British monarchs, although the official seat of the Court was and remains at St. James's Palace, which has not been the actual royal residence in London since the 17th century. Additional improvements soon after included Queen Mary's extension of her apartments by building the Queen's Gallery and, after a fire in 1691, the King's Staircase was rebuilt in marble and a Guard Chamber was constructed, facing the foot of the stairs. William had constructed the South Front, to the design of Nicholas Hawksmoor, which included the Kings' Gallery where he hung many works from his picture collection. Mary II died of smallpox in the palace in 1694, and in 1702, William suffered a fall from a horse at Hampton Court and was brought to Kensington Palace, where he died shortly afterwards from pneumonia. After William III's death, the palace became the residence of Queen Anne. She had Christopher Wren complete the extensions that William and Mary had begun, resulting in the section known as the Queen's Apartments, with the Queen's Entrance, and the plainly decorated Wren designed staircase, that featured shallow steps so that Anne could walk down gracefully. These were primarily used by the Queen to give access between the private apartments and gardens. Queen Anne's most notable contribution to the palace were the gardens. She commissioned the Hawksmoor designed Orangery, modified by John Vanbrugh, that was built for her in 1704. The level of decoration of the interior, including carved detail by Grinling Gibbons, reflects its intended use, not just as a greenhouse, but as a place for entertaining. Also, a magnificent 30 acre (121,000 m2) baroque parterre, with sections of clipped scrolling designs punctuated by trees formally clipped into cones, was laid out by Henry Wise, the royal gardener. Kensington Palace was also the setting of the final argument between Sarah, Duchess of Marlborough and Queen Anne. The Duchess, who was known for being outspoken and manipulative, was jealous of the attention the Queen was giving to Abigail Masham, Baroness Masham. Along with the previous insensitive acts of the Duchess at the death of Anne's husband, Prince George of Denmark, who had died at Kensington Palace in October 1708, the friendship came to an abrupt end on 6 April 1710, with the two seeing each other for the last time after an argument in the Queen's Closet. Queen Anne died at Kensington Palace on 1 August 1714. George I spent lavishly on new royal apartments, creating three new state rooms known as the Privy Chamber, the Cupola Room and the Withdrawing Room. He hired the unknown William Kent in 1722 to decorate the state rooms, which he did with elaborately painted trompe l'oeil ceilings and walls. The Cupola Room was Kent's first commission for the King. The octagonal coffering in the domed ceiling was painted in gold and blue, and terminated in a flat panel decorated with the Star of the Order of the Garter. The walls and woodwork were painted brown and gold to contrast with the white marble pilasters, doorways and niches which were surmounted with gilded statuary. George I was pleased with his work, and between 1722, and 1727, Kent oversaw the decoration and picture hanging for all of the royal apartments at Kensington Palace. Kent's final commission was the King's Grand Staircase which he painted with 45 intriguing courtiers from the Georgian court, including the King's Turkish servants Mahomet and Mustapha, Peter 'the wild boy' as well as himself along with his mistress. King George I also enlarged the palace with the addition of an apartment, built on the north-west side, to house his mistress, Melusine von der Schulenburg, Duchess of Kendal. The last reigning monarch to use Kensington Palace was George II, who did not undertake any major structural changes to the palace during his reign, and left the running of the palace to his wife Queen Caroline. At the request of the Queen, Charles Bridgeman, successor to Henry Wise as royal gardener, swept away the outmoded parterres and redesigned Kensington Gardens in a form that is still recognisable today: his remaining features are The Serpentine, the basin called the Round Pond, and the Broad Walk. After the death of his wife, George II neglected many rooms and the palace fell into disrepair. King George II died at Kensington Palace on 25 October 1760. With the accession of King George III in 1760, Kensington Palace was only used for minor royalty. The sixth son of George III, Prince Augustus Frederick, Duke of Sussex, was allocated apartments in the south-west corner of Kensington Palace in 1805 known as Apartment 1. He was interested in the arts and science and amassed a huge library that filled ten rooms and comprised over fifty thousand volumes. He also had a large number of clocks, and a variety of singing birds that were free to fly around his apartments. He was elected as president of the Royal Society and gave receptions in his apartments at Kensington Palace to men of science, but the expense they incurred induced him to resign the presidency, as he preferred to employ the money in making additions to his library. The Duke of Sussex caused quite a scandal when he married twice in contravention of the (Royal Marriages Act 1772) because it had not been approved by the King. His second wife, Lady Cecilia Letitia Buggin, was never titled or recognised as the Duchess of Sussex. However, she was created Duchess of Inverness in her own right in 1840. The Duke died at Kensington Palace in 1843, and as he had lived beyond his means and amassed substantial debts, his possessions, including the library, were sold after his death. The Duchess of Inverness continued to reside at Kensington Palace until her death in 1873. Prince Edward, Duke of Kent and Strathearn, the fourth son of King George III, was allocated two floors of rooms in the south-east corner of the palace, below the State Apartments, which he renovated for his use. The apartments were next to his near-blind sister Princess Sophia. His daughter, Alexandrina Victoria was born on 24 May 1819, and her christening conducted in the Cupola Room the following month. The Duke of Kent and Strathearn died nine months after the birth of his daughter, and she grew up in the confines of the palace in an unhappy and lonely childhood as a result of the Kensington System adopted by her mother, Victoria, Duchess of Kent and the domineering Sir John Conroy, her mother's comptroller of the household. Princess Sophia fell under the sway of Conroy, who took advantage of her senility and blindness. She frequently served as his spy on the Kensington household as well as on her two elder brothers, while Conroy squandered most of her money until she died in 1848, at Kensington Palace. In 1837, Princess Alexandrina Victoria was awakened to be told that her uncle, King William IV had died and that she was now queen. She took the regnal name of Victoria and held her first privy council in the Red Saloon at the palace. The Queen promptly moved to Buckingham Palace, but she did grant rooms in Kensington Palace to her family and retired retainers, which included the Duke and Duchess of Teck, parents of Queen Mary (grandmother of the present Queen), who was born at Kensington Palace in 1867. In 1873, Princess Louise, Duchess of Argyll was given Apartment 1 that were formerly occupied by the Duchess of Inverness, widow of the Duke of Sussex. Princess Louise had an art studio in the palace from which the statue of Queen Victoria in Kensington Gardens was sculpted. Louise made one change to her apartments when she ordered the windows bricked up after discovering her husband, Lord Lorne, was climbing through them to visit a lover at night. Louise's younger sister, Princess Beatrice, was given by Queen Victoria the apartments once occupied by the Queen and her mother below the State Apartments. During World War I, George V allowed a number of rooms in the palace to be used by those working for Irish POWs and Irish soldiers at the front, and decreed that its royal inhabitants adhere to the same rations as everyone else. The royal inhabitants now included Princess Helena, Duchess of Albany, Princess Alice, Countess of Athlone, and the Earl of Athlone. In 1921, upon widowhood, Victoria, Marchioness of Milford Haven, moved into a grace-and-favour apartment at Kensington Palace. During this period, her grandson, Prince Philip, lived with her at times as she was in charge of his education. As a result of the number of royal relatives residing there during the 1920s and 1930s, Edward VIII called the palace "the aunt heap." Kensington Palace was severely damaged during The Blitz of 1940 when it was hit by an incendiary bomb that exploded in the north side of Clock Court, damaging many of the surrounding buildings including the State Apartments, particularly the Queen's Apartments. The Headquarters of Personnel Section occupied Apartment 34, and as a result the garden was overrun with anti-aircraft guns, sandbags and trenches. Repairs to the palace were not completed for several years, but after the war, Prince Philip stayed with his grandmother in the lead-up to his 1947 marriage with Princess Elizabeth, later to become Queen Elizabeth II. With the bombing damage and the deaths of Princess Louise and Princess Beatrice, the palace entered a period of neglect. During the 1950s, residents of the palace included Master of the Horse, Henry Somerset, 10th Duke of Beaufort who had married Lady Victoria Cambridge (a niece of Queen Mary as the daughter of the 1st Marquess of Cambridge), Sir Alan Lascelles, Queen Elizabeth's private secretary and Princess Alice, Countess of Athlone who lived in the palace until her death in 1981. In 1955, the widowed Princess Marina, Duchess of Kent moved into Apartment 1, with her children, which had been vacant since Princess Louise's death in 1939. It was at this time that the apartment was divided and Apartment 1A created. The stylish Duchess of Kent continued to live in the apartment until her death at Kensington Palace of a brain tumour in 1968. Following their wedding on 6 May 1960, Princess Margaret, Countess of Snowdon, sister of Queen Elizabeth II, and the Earl of Snowdon, moved into Apartment 10, that Princess Margaret termed "the doll's house," which had been vacated by the recent death of the Marquess of Carisbrooke, eldest son of Princess Beatrice, Queen Victoria's youngest daughter, while they set about transforming the much larger Apartment 1A to new designs. In 1960, Kensington Palace was under the auspices of the Department of the Environment, and the renovation had to be carried out under the strictest of budgets, with the eventual costs coming in at £85,000 (approximately £1.5 million today). By 1962, the whole interior had been gutted and all the floors, except the attic floor, had been removed to deal with rising damp. The resulting modern apartment consisted of the main reception rooms, three principal bedrooms and dressing rooms, three principal bathrooms, the nursery accommodation, nine staff bedrooms, four staff bathrooms, two staff kitchens and two staff sitting rooms. Twenty ancillary rooms included a linen store, a luggage room, a drying room, a glass pantry and a photographic dark room for Lord Snowdon. The house in 18th century style, had a modern color palette with the bold use of colours including Margaret's favorites, pink and kingfisher blue. The house was largely designed by Snowdon and Princess Margaret with the assistance of the theatre designer Carl Toms, one-time assistant to Oliver Messel, Lord Snowdon’s uncle, and a close friend of the royal couple. The royal couple moved into Apartment 1A on 4 March 1963, prior to the birth of their daughter, Lady Sarah, who was born at the palace the following year. Prince and Princess Richard of Gloucester (later Duke and Duchess of Gloucester) moved into Apartment 1, the 21-room house previously occupied by Princess Marina, after their marriage in 1972, where they subsequently raised their three children. In 1994, after the Gloucesters had to give up their country home, Barnwell Manor, for financial reasons, they moved the Duke's aged mother Princess Alice, Duchess of Gloucester, from Barnwell to Kensington Palace where she died in her sleep on 29 October 2004 at age 102. She holds the record as the oldest person in the history of the British Royal Family. The Queen gave the keys to the five-bedroom, five-reception grace-and-favour Apartment 10 to Prince and Princess Michael of Kent on the occasion of their marriage in 1978. In 2008, there was controversy when it was claimed that the couple paid a rent of only £70 per week, though they fulfilled no official duties on behalf of the Queen. The British Monarchy Media Centre denied these reports and stated that, "The Queen is paying the rent for Prince and Princess Michael of Kent's apartment at a commercial rate of £120,000 annually from her own private funds... This rent payment by The Queen is in recognition of the Royal engagements and work for various charities which Prince and Princess Michael of Kent have undertaken at their own expense, and without any public funding." It was announced that from 2010, that Prince and Princess Michael would begin paying rent of £120,000 a year out of their own funds to continue living in the apartment. In 1996, Prince Michael's older brother, Prince Edward, Duke of Kent and his wife Katharine moved into Wren House on the Kensington Palace estate. In 1981, in the part of the palace that King George I had built for his mistress, the Duchess of Kendal, Apartments 8 and 9 were combined to create the London residence of the newly married Prince of Wales and his wife, Diana, Princess of Wales, and it remained the official residence of the Princess after their divorce until her death. Her sons, Princes William and Harry were raised in Kensington Palace and went to local nursery and pre-preparatory schools in Notting Hill, which is a short drive away. According to Andrew Morton, the palace was a "children's paradise" with its long passageways, a helicopter pad, and many outdoor gardens, including one on the roof where the family spent many hours. Upon Diana's death on 31 August 1997, the gates at Kensington Palace became the focus of public mourning with over one million bouquets, reaching 5 feet (1.5 m) deep in places, placed as tribute before them stretching out into Kensington Gardens. The Princess's coffin spent its last night in London at the palace. On the morning of 6 September 1997, a tenor bell signalled the departure of the funeral cortege carrying the coffin from the palace on a gun carriage to Westminster Abbey for the ceremony. Diana, Princess of Wales's residence was stripped bare and lay vacant for 10 years after her death until it was split back into two apartments, with Apartment 8 being used by four of Charles's charities and Apartment 9 becoming home to the Chief of Defence Staff. On 6 November 2011, it was announced that the Duke and Duchess of Cambridge would move from their temporary residence of Nottingham Cottage on the Kensington Palace grounds, to the four-storey, 20-room Apartment 1A, formerly the residence of Princess Margaret. Renovations took 18 months at a cost of £4.5 million. The building costs included new heating, electrics and plastering, and the removal of asbestos that required nearly everything to be stripped out internally, as well as a new roof. On 28 March 2012, it was announced that Prince Harry had moved his residence from Clarence House to a one-bedroom apartment at Kensington Palace. The announcement of Prince Harry's engagement to Meghan Markle included a statement that the couple would live in Nottingham Cottage after their May 2018 wedding until the birth of their first child in Spring 2019. In April 2018, Princess Eugenie moved from St James's Palace into Ivy Cottage at Kensington Palace. She lives there with her husband Jack Brooksbank. By the end of the 19th century, the State Rooms were severely neglected. The brickwork was decaying and the woodwork was infested with dry rot. Calls were made for the palace to be demolished, but Queen Victoria declared that "while she lived, the palace in which she was born should not be destroyed". In 1897, Parliament was persuaded to pay for the restoration which was completed two years later. The State Rooms were opened to the public on the Queen's birthday, 24 May 1899. This began the palace's dual role as a private home to royalty and a public museum. Queen Mary was instrumental in opening the State Apartments as a temporary location for the London Museum (now known as the Museum of London) from 1911 to 1914. The State Apartments were filled with showcases, some containing hundreds of objects including 18th-century costumes and dresses worn by Queen Victoria, Queen Alexandra and Queen Mary. The museum returned from 1950 to 1976 before it moved to its permanent home on London Wall. The Kensington Palace State Rooms underwent a two-year, £12 million renovation, underwritten with contributions from the Heritage Lottery Fund as well as other public and private sources. New uniforms for staff were designed by Stuart Stockdale at Jaeger. The re-opening of the palace occurred in time for the Diamond Jubilee of Queen Elizabeth II in 2012. Visitors now can choose four different routes throughout the palace that offer exhibits incorporating cutting-edge digital presentations, interactive experiences, and even audio sequences that bring to life the gatherings of gowns, antique furniture, and other memorabilia of notable residents of the palace including William and Mary in the Queen's State Apartments, the court of George I and II in the King's State Apartments and the life of Queen Victoria in the rooms most associated with her. The fourth exhibit displays selections of Queen Elizabeth's wardrobe in the 1950s, Princess Margaret from the 1960 and 70s and Diana, Princess of Wales in the 1980s during their fashion heyday. The grounds of the palace were also renovated with enhancements including eliminating railings, fences, and shrubs that had undermined royal gardener Charles Bridgeman’s original landscaping. Two new public gardens to the south and east of the palace were installed that connect the property to Kensington Gardens. 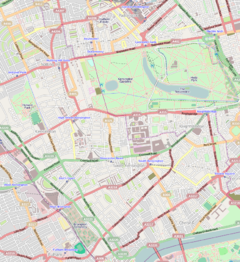 The nearest tube stations are Queensway, Bayswater, Kensington High Street, or (slightly farther) Gloucester Road. ^ "Who We Are". Historic Royal Palaces. Archived from the original on 1 September 2011. Retrieved 9 January 2012. ^ "What was here before Kensington Palace? - HRP Blogs". 31 January 2019. Archived from the original on 31 January 2019. ^ a b "Origins," Kensington Palace official website, Retrieved 1 May 2013. ^ "'Kensington Palace', Old and New London: Volume 5 (1878), pp. 138-152". Retrieved 13 November 2015. ^ Hedley, Olwen (1976). Kensington Palace: The State Apartments (Illustrated ed.). Northwestern University: Pitkin Pictorials. Retrieved 31 January 2019. ^ Allen, Caroline; Wessex (Earl of), Edward (1999). Edward Wessex's crown and country: a personal guide to royal London (1 ed.). London: HarperCollinsIllustrated. ISBN 978-0789304780. Retrieved 31 January 2019. ^ "Queen Victoria: the original people's princess". Retrieved 25 April 2014. ^ a b Freedman, Lisa (6 April 2013). "A right royal starter home: As the Duke and Duchess of Cambridge prepare to move into Apartment 1A at Kensington Palace this summer, Lisa Freedman revisits the house during its 1960s heyday". Daily Mail. Retrieved 13 May 2014. ^ Alderson, Andrew (17 February 2002). "Margaret's home to be opened to public". The Daily Telegraph. London. Retrieved 4 June 2009. ^ Cockcroft, Lucy (6 October 2008). "Prince and Princess Michael of Kent to pay £120,000 rent for Kensington Palace flat". The Daily Telegraph. London. Retrieved 4 June 2009. ^ Routledge, Paul (14 June 2002). "Comment on Queen's grace-and-favour apartments". Daily Mirror. London. Retrieved 4 June 2009. ^ "Growing Up Royal". Time. 25 April 1988. Archived from the original on 31 March 2005. Retrieved 4 June 2009. ^ Tominey, Camilla (18 December 2011). "Princes William and Harry back in Diana's flat". Express. Retrieved 15 May 2014. ^ Jephson, Patrick (14 July 2013). "Kensington Palace could feel like a prison to the newest Royal". Express. Retrieved 17 July 2013. ^ Foster, Max (26 June 2014). "Royal palace upgrade for William, Catherine and George costs $7.6 million". CNN. Retrieved 26 June 2014. ^ "Prince Harry moves into Kensington Palace". CBS News. 28 March 2012. Retrieved 18 June 2013. ^ "Prince Henry of Wales & Meghan Markle are engaged to be married". The Prince of Wales. 27 November 2017. Retrieved 27 November 2017. ^ "Official Service Residences for senior military officers - Gov.uk" (PDF). British Ministry of Defence. 28 March 2012. Retrieved 2 February 2015. ^ "Queen Victoria," Kensington Palace official website, Retrieved 27 April 2014. ^ Porter, Laura. "Kensington Palace". Retrieved 27 April 2014. ^ "Kensington Palace unveils new Jaeger staff uniforms - Telegraph". fashion.telegraph.co.uk. Retrieved 4 July 2018. ^ Owens, Mitchell (June 2012). "KENSINGTON PALACE'S NEW LOOK". Architectural Digest. Retrieved 27 April 2014. Impey, Edward (2003). Kensington Palace: The Official Illustrated History. London: Merrell Publishers in association with Historic Royal Palaces. ISBN 978-1-85894-205-6. OCLC 51569080. 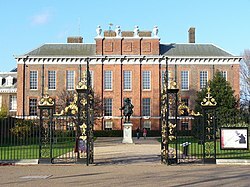 Wikimedia Commons has media related to Kensington Palace.